The club hosts a biennial Garden Walk or Garden Party in the spring or summer which alternates with the club's Flower Show. Proceeds from this event are used for horticultural scholarships and Garden Therapy at a community site. at the Bella Vista Visitors' Center on Highway 71. 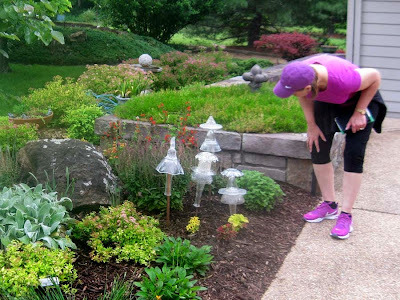 The successful 2014 Garden Walk was held on June 7th. The Garden Walk raised over $3,000 for Club Projects such as: horticultural scholarships; garden therapy for residents at Concordia and Brookfield; and plantings at the Veterans Wall of Honor, the Bella Vista Memorial Garden Cemetery, and the Visitor Center/Blue Star Memorial Garden. Village Garden & Landscape Center. The proprietor, Brien Grosenickle is a member of the BVGC. There were special values for tour guests throughout the day. 1 Melanie Drive featured a delightful metal tree filled with bird houses attached to a wall on the north side of the house. Guests stepped through the arbor into the backyard and found a restful garden with a variety of plants. Metfield Pavilion - Eat and Meet. This stop featured grilled hot dogs, chips and a drink for $4 from 11 a.m. to 2 p.m. Garden Club members who are also Master Gardeners were available to answer questions and there was a show of cement planters and info on how to make them. 12 Morganshire Dr. was a lovely stop where the homeowners did a great job of making utility boxes disappear into the landscape. 1 Ancroft Ln. had charming pathways that lead guests from casual to formal gardens. There were lots of places for the grandchildren to hide. 18 Reighton Circle featured an impressive raised bed vegetable gardens. The flower gardens went on and on flowing from one beautiful area into another. 83 Dogwood Dr. delighted visitors with a stone "perch" in the back yard where you could watch the golfers play and a stream flow by. 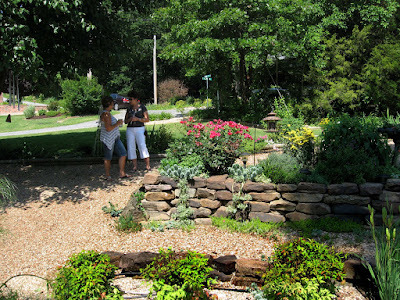 Berms covered with shrubs and flowers gave the front yard privacy. Visitors enjoyed the crystal ornaments. Some were for sale. 46 London Dr. featured a New England style house with it's white picket fence. The many shrubs resulted in it rightly being called the "Boxwood House". Guests wandered through the backyard's charming vignettes viewing many statues. 2011 Garden Walk's was held on June 4th. The gardens selected were all unique and provided visitors with inspiration for their own plantings. Tickets were $8 in advance and $10 the day of the tour. In addition to the homes, two nurseries were included on the tour. Refreshments and gifts were provided and experts were available to give programs and gardening advice. Experts included: Dr. Sealy from the University of Arkansas; Brenda Embry, the Butterfly Lady; scholarship recipient, Bill Towle; and Benton County Master Gardeners. 2011 Committee Chairmen: Beth Kastl, Sue Beaty and Nancy Bumgardner. 2009's highly anticipated event showcased five of Bella Vista's most beautiful gardens. Each home was unique and sparked ideas for visitors to incorporate in their own gardens. The addresses of these homes follows. Click here for an online map with directions to these homes. Maps were also available at each of the Garden Walk homes. The nursery had the following activities: Benton County Master Gardeners who answered all gardening questions, a presentation on "Gardening with Containers" and "Butterfly Gardens," raffle items and children's activities.